Cannondale today announced the launch of the Quick NEO and Quick NEO EQ, its newest sportive fitness and high-speed urban adventure e-bikes. Built for riders seeking road-bike speed combined with the comfort and ease of an upright, flat-bar riding position, the Quick NEO and Quick NEO EQ are fun, fast e-bikes designed to get those with active lifestyles out on to the open road. The all-new Quick NEO and Quick NEO EQ share the same ride qualities as their analog sibling the Quick, balancing the sporty feel and handling of a low forward position, with the comfort offered by a more upright stance. Aiding in the bikes’ poised handling is Cannondale’s OutFront steering geometrywhich delivers high-speed stability and road-bike quickness, while also reducing the chance of your toe overlapping the front wheel on smallersizes.Furthermore, Cannondale’s SAVE Micro-Suspension and 700x35c tires deliver a smooth ride and great traction on uneven terrain. The Quick NEO and Quick NEO EQ feature the lightweight and nearly silent Bosch Generation 3 Active Line Plus drive unit which provides intuitive power delivery and resistance-free pedaling beyond the assist cut-out threshold. It is the perfect motor for fast-paced fitness riding or zipping around town. The drive unit is paired with a 500 Wh PowerTube battery that integrates cleanly into the bike’s downtube and packs enough power to really kick rides into high gear.A removable fender bridge, rack and fender mounts, as well as pre-wired cables for front and rear lights addto the Quick NEO’s all-around versatility, while the Quick NEO EQ’s integrated lights, kickstand, and unique fender outfitted with a pannier mount, make it ideal for commuting, running errands, or weekend adventures. The new Quick NEO and Quick NEO EQ offer riders the freedom to quickly and easily get where they need to go. Fast, fun, elegant and comfortable, these bikes bring a new level of sporty excitement to fitness and urban riding. The new Quick NEO and Quick NEO EQ are available in sizes small through extra-large. Also launched today is the Synapse NEO, a drop-bar bike featuring a Bosch Active Line Plus motor (class 1, 20 mph) with a Bosch Power Tube. They’ve actually done something rare with a Bosch system, offering dual chainrings up front, enabling riders to always find the right gear to make the most of their power. Additionally, Cannondale’s Asymmetric Integration (Ai) Offset Drivetrain, allows the Synapse NEO to have short chainstays for nimble handling and tire clearance for up to a 700x35mm tire,offering riders maximum comfort. Other thoughtful details such as a removable fender bridge, subtle rack and fender mounts, and pre-wired cables for front and rearlights add to the Synapse NEO’s versatility and appeal. An SE model will also be available, specially equipped with high-volume 650x47c tires and wide-range gearing for those adventurous souls looking to explore beyond the paved and predictable.With its comfortable, composed feel, smooth power delivery and massive gear range, the Synapse NEO makes the joys of road riding available to all. The new Synapse NEO line-up will feature three 700cmodels, and one 650b SE model, available in 4 sizes:S (45cm) M (50cm), L (54cm), XL (58cm). 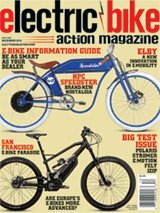 Bikes will be available at European retailers this October with more regions to follow later in the year. Prices, depending on trim level, start at €3299 and go up to €5999.